I don’t get a lot of my points from buying stuff. The vast majority come from the 3 methods I am going to list here. A lot of people still don’t know about them, so I thought it would be good to list them here. The best thing is, they are easy to do. They are also free to do, and all you need is your laptop or PC. If you like filling in surveys, or you have the spare time (durations vary from a few minutes to 30 minutes) then these surveys are great. You fill in your basic details, then wait for the survey opportunities to arrive via email. They target potential responders via certain demographics so make sure you fill all the details in. Surveys Review: Ideal if you already do surveys or have a bit of spare time. They can also be quite fun because they only offer you surveys that are specific to your interests. The points earned for the amount of time spent is quite fair relative to the other 2 ways listed on this page. 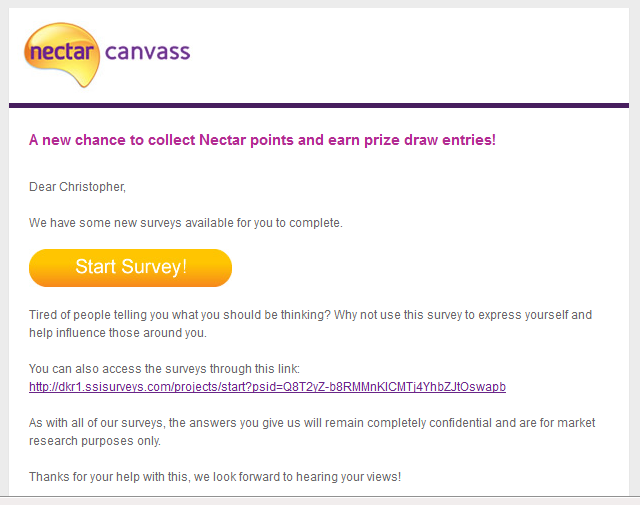 How To Start Collecting Points: Visit this page: https://www.nectar.com/collecting-points/sponsors/nectar-canvass and follow the instructions. The toolbar is very simple. It contains a search box, which searches Yahoo. For every 2 searches you do, you receive 1 point. Up to a maximum of 100 points per month. At the time of writing they give you a 100 point bonus just for installing it. If you already use Yahoo this is ideal for you, even if you don’t it is worth installing just to blast a few extra points. One thing I would say is if you already have other toolbars installed in your browser it may be best to uninstall some of them. I already had the Alexa toolbar and Stumbleupon toolbar and once I added this it got a bit messy. So if you too have a couple of toolbars already installed, look at maybe uninstalling one. It will speed up your browser. ToolBar Review: Better than the other 2 ways in that we all use search engines anyway, so by using this you are earning points for doing something you would have already been doing. Another bonus to it is that it reminds you which websites you can collect points on. Meaning if you are doing online shopping and are on an eligible e-commerce site it will tell you in the toolbar. 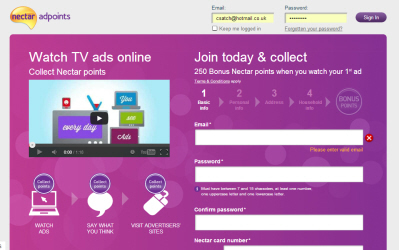 How To Start Collecting Points: Visit this page: http://www.nectar.com/collect/nectar-search.points and follow the instructions. A visitor to this website kindly sent me an email with this tip as well. You can grab 120 points by joining the Oxfam Tag A Bag program, it is only open to UK taxpayers though. Read more about it here. UPDATE: Adpoints was closed down so unfortunately this opportunity is no longer valid. In this method, you have to watch short videos (such as movie trailers), click a little button to say you are still viewing and then give it a rating. Once you have done that you bank a few points. The videos vary in length from 30 seconds up to around 2 minutes. You can watch as many or as few as you want. The trick I have found with this is to actually be interested in the clips, click on the ones you want to watch. Because if it bores you then the temptation to minimize the window increases, a lot. But you need to click the ‘still watching’ buttons to earn the points. Be interested and it can actually be fun. At the time of writing they have quite a lot of ZSL London zoo videos which I’ve enjoyed watching and some good movie trailers as well. They also have product ads, and supermarket ads. These are the type of videos you can expect to watch. Ad Points Review: This is my personal favourite way to earn points because you can earn up to 250 points per week. And because you are watching lots of different short clips I find it more engaging then the other ways. I find it is best to make a coffee, fire up the website, and just watch the different clips I want to for 15 minutes or so. Do that each day and the points build up nicely. How To Start Collecting Points: Sorry, the link is no longer available. So there you have it. Utilize these 3 methods every month and in 6 months time you could have built up a fair amount of extra points, on top of your existing spending. Don’t forget that points individually aren’t that valuable, you need to build up quite a lot. And watching the ads, surfing and responding to surveys will take time. So the return on your time isn’t great. The trick is to do it in your spare time, and enjoy the ads, surveys and searching the web. Make it enjoyable and you will rack up more points and have more fun!